Governance and Finance of Metropolitan in Federal Systems is a series of research essays which are compiled and edited by Enid Slack and Rupak Chattopadhyay. 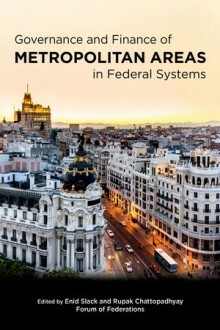 The book is not for the faint of heart, as it is a truly academic overview of metropolitan governance and finance structures from a wide range of federal states. The various authors highlight the diversity and challenges that face city governments around the world, whether dealing with the effective delivery of services to ensuring the correct balance of between governance structures and responsiveness to citizens needs. Each essay examines two metropolitan jurisdictions within a federal country. This analysis compares the two jurisdictions providing a short breakdown of the history and geography, how they stand within the federal system of their nation, their economic and financial structure and an overview of the challenges they face. Slack and Chattopadhyay do a excellent job of bringing together the case studies from the authors and uniting them under the umbrella of a small number of issues and challenges that related to geography and sharing power across differing levels of government. Although the book is primarily an evaluation of the different governance types and financial systems the only issue that I have is that the authors do not draw any conclusions on which government or financial system works best. Should metro municipalities gravitate towards a single one tiered structure for more efficiency or a towards a fragmented two-tier structure that allows greater representation? How does the system of governance in South Africa compare to that of Canada or the United States? Despite there not being a right or wrong answer to these questions it would have been great to hear the editors’ insights. As for whether you should read this book, if you have serious interest in city finance and governance around the world this book is a must read, for the more causal observer it could be a hard slog to complete.